Microsoft have announced bunch of new services to their Skype for Business Preview services that are based on O365. One of the services that was announced, was the preview availability of the cloud PBX with on-premises PSTN Connectivity. With the cloud PBX service, organizations will now have the ability to leverage their existing on-premises PSTN lines such as ISDN or SIP Trunks to terminate calls to users that are enabled for O365. Before jumping on to preview Cloud PBX services, there’s a very important prerequisite that need to be fulfilled. That is having a Lync\Skype for Business Server hybrid setup already in place that configured with Enterprise Voice. 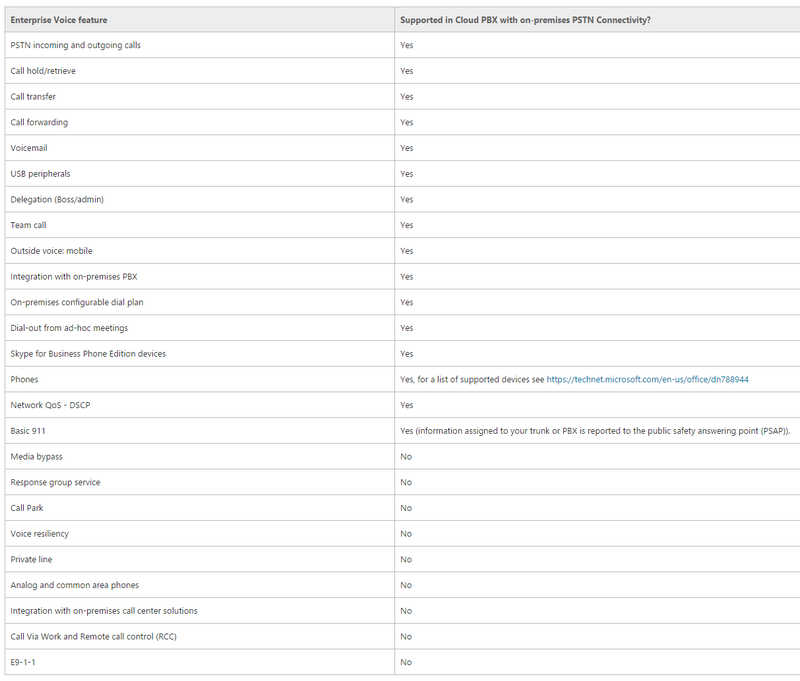 Also, you would need to have Office 365 E4 licenses for the number of users that are enabled within Office 365. This option is available for organizations that are having Lync 2010 servers that are running with CU no earlier than October 2012. But, the catch is that, they need to have Lync server 2013 or Skype for Business Server 2015 Edge servers to support the hybrid integration. So if you’re having Lync Server 2010 and considering Cloud PBX, it’s high time to move to Skype for Business Server 2015. Even though cloud enable users are losing some of features, most of important and critical features are still available for them which is really good. Microsoft have announced the availability of Azure Express Route to Office 365 several months ago. Organizations can leverage on this to enhance the connectivity to O365 with assuring a better bandwidth availability and control rather than using the standard internet services. This would also benefit in configuring Quality of Service (QoS) for media traffic that is essential to improve the media quality and overall cloud user experience. On side note, this would improve the user sign in time as well. 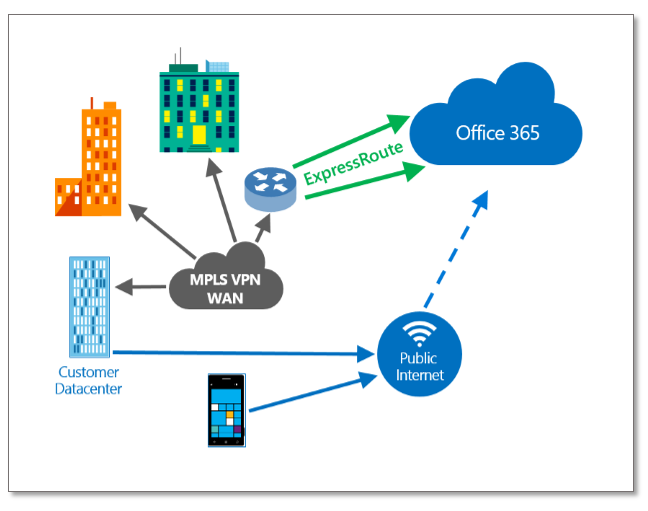 Below is a sample diagram that illustrate the connectivity between corporate network and O365 over express route. Moving users to Cloud PBX and enabling for Enterprise Voice. Enable users for Enterprise Voice (performed while the users are homed on-premises). Assign a voice routing policy (performed while the users are homed on-premises). Obtain and activate a promo code, so that you can preview this feature. Synchronize users to the cloud and assign licenses (performed using Office 365). Move users to Skype for Business Online (performed using Windows PowerShell on-premises, but using your Office 365 administrator credentials). Enable the users for Enterprise Voice and Cloud PBX Voicemail (performed using Remote PowerShell). Migration of user accounts should be none intrusive and users will not lose any configuration that they made on their client. As mentioned above, the service is still on it’s preview stage and it will become GA pretty soon and this would be a one step forward for the organizations that are looking forward to move in to Office 365.